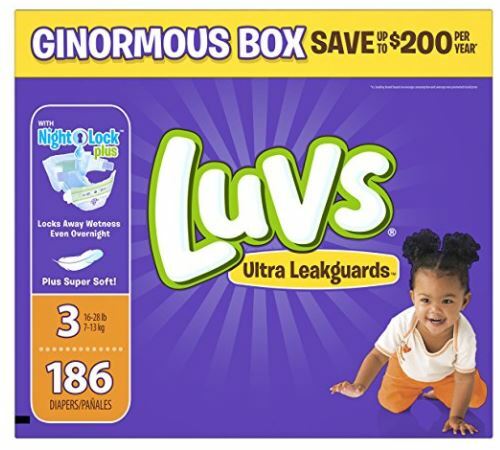 Here is a stock up price on Luvs Ultra Leakguards Diapers Size 3. Score a Ginormous box of these Luvs for ONLY $13.98 + free shipping with the $2 coupon and Subscribe & Save option. With this offer, you will be paying only 7.5¢ per diaper and for size three that is definitely a stock up price. This offer requires you to be a Prime member. If you are not currently a member, you can get your free 30-day trial here. Then clip the $2 Luvs Ultra Leakguards coupon found here under the price. Select the Subscribe & Save option and add to your cart. Final price will be $13.98. New to Subscribe and Save? Amazon often offers discounts if you sign up to receive auto shipments (which can be canceled at any time). After you receive your order you can choose to not continue with the scheduled deliveries – just go to your Amazon account and cancel your subscription under the “Manage Subscribe and Save” tab. Get your Luvs Ultra Leakguards diapers HERE while they are at this low price. Please note, this price may change quickly so don’t delay if you are planning to buy.